In this eBook, you’ll find four best practices that reflect recent thinking about Customer Experience (CX). As you consider these best practices, we urge you to broaden your definition of customers beyond buyers to include employees, suppliers, and vendors. All have opinions about their experiences with your company, and many will share them via word of mouth or online. For better or worse. According to the experts, CX is your key to competitive advantage and growth. 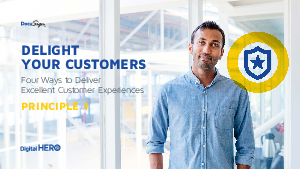 Read on to find out what you can do to deliver stellar CX.